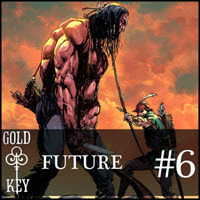 In this episode of Gold Key Future, Joshua and Paul get a double dose of Turok. Plus, we look at the latest from Magnus and Solar. Gold Key Future - Magnus: Robot Fighter #7, Solar: Man of the Atom #6, Turok: Dinosaur Hunter #8, and Turok: Dinosaur Hunter #9.